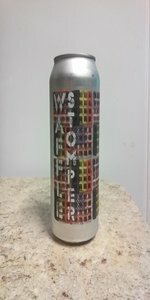 Waffle Stomper | Burley Oak Brewing Co.
Belgian yeast combines with American hops to create this unique IPA. Fruity notes from the Belgian Yeast as well as Citrus from the use of Perle, Simcoe, Cascade and Citra Hops. Dry Hopped with Simcoe, Citra and Nelson Sauvin. Poured from a 16 oz. can. Has a dark golden color with a 1/2 inch head. Smell is of yeast, light citrus. Taste is citrus, pineapple, pepper, some yeast funkiness, hints of alcohol, mild bitterness Feels medium bodied in the mouth and overall is a solid beer. I see what's they're trying to do here and I wholeheartedly approve, but this beer is either old and the dry-hopping flavors have faded, or they need to change the profile. Belgian yeast flavorb draped in faded west coast hops. Would love to give this another go on draft or fresh, but currently this isnt a repeat beer. Poured into a nonic pint glass. This ale looks like honey. Deep, golden, and foggy. Big and small bubbles speckle a white head about a the width of a finger. Unfortunately, the head disappears quickly. Smells of apples, pears, honey, some flower(s) I cannot recognize, peach, sour ganja, and cardamom. Taste is very balanced. Simcoe, citra, and cascade hops all steal the show but the real MVP is the solid malt backbone that makes this wholesome beer oh-so-drinkable. There is a lingering resin-y aftertaste long after the beer is finished. Mouthfeel is creamy yet spicy. Burley Oak has won me over with this one, folks. Maryland is really up and coming with it's craft brew scene and this is the cream of the crop. On to my second one now. Look: A dark, somewhat murky orange with an off-white foam head. Nice lacing and decent retention. Aroma: As expected, big Belgian yeast funkiness with a pleasant citrus backdrop. Taste: Belgian funk up front and somewhat peppery hops towards the back. Nice citrus undertones from the hops similar to the aroma, a really unique mix that doesn't disappoint. Feel: Just the right level of astringency and bitter sweetness, the funk lingers for a bit. Minimal carbonation. An excellent Belgian IPA! Poured from a 16 oz. can into a Belgian tulip, no date on the can. Look: Dark orange body with a thin cap of bubbles on top. Smell: Definite Belgian yeast funkiness up front with lemon, orange and pine. Taste: Belgian funk with citrus following and then a strong bitterness towards the end. Feel: Full mouth feel with plenty of bitterness and funkiness. Minimal carbonation. Overall: Really enjoyable Belgian IPA. Strong amount of bitterness from the SImcoe hops with a hefty amount of citrus from the Citra and Cascade. Really enjoyed this one! Definite funk to this beer with complex layering of smells and tastes. Took about 3 or 4 sips to get everything and have it all come together on my palette. Waffle Stomper from Burley Oak Brewing Co.